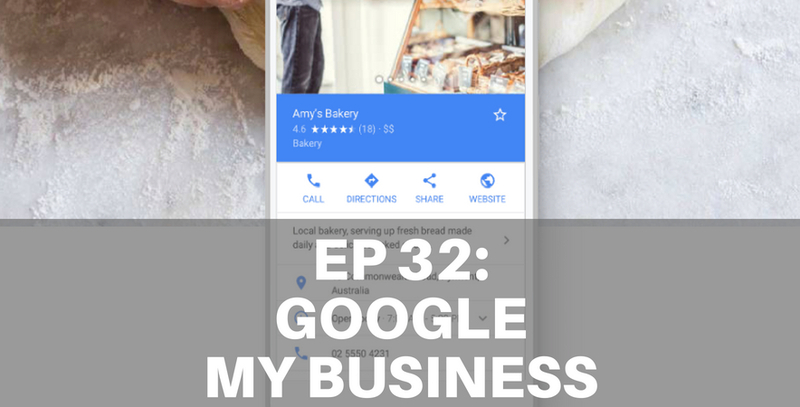 In today's episode, we tackle Google My Business which is the key to getting found in Local Search. Darryl: Hi I'm Darryl King and I'm here with my co-host Ed Pelgen were a couple of old internet guys, who have been running our online agencies for over twenty years. We get together every week to talk about all things online especially for small and medium business owners or executives who talk about their websites as their bloody website. Each week we aim to tackle a range of online issues, put them in plain language so anyone can understand, how to make their websites work better for their business. Episode 32 - We're going to talk specifically about: Google my Business. Hey Ed. Edmund: Hey Darryl, How are you? Darryl: why don't; when we start by for those people that don't know you want to give them an overview about; what Google my business is? Where I sort of come from? How it fits into the ecosystem…? Edmund: yeah so; absolutely; so to really understand Google my business and we did an episode on local before and it's just important to understand that a lot of search is local in nature meaning I'm in a place and I'm looking for something in my general vicinity, I'm looking for a local provider, I'm looking for a restaurant, I'm looking for a plumber in my area right? So but very nature a large percentage of searching that's done online is local especially with the advent of the mobile phone. A lot of it is, it's very local and because Google owns android they know where you are physically and they can tailor the search results to your device so local is very important. Now the way that you get your business listed in the Google system the Google ecosphere; I suppose, is that you have to submit and list your business in the platform, which is Google my business right? So you basically need to go to sign up, fill in all your details and because it's a local business there’s a process called verification. So they'll either; ring you using the phone number that you signed up with or they will send you a little physical card which gets sent to your physical address. Darryl: Where do people see Google my business results, well like, what; what's the; I’m Bob; I’m out there with my business. Why do I care about this? Darryl: Where does it impact me? Darryl: when on a phone or on a desktop, what; how do I know what you're talking about? Darryl: I want to interject something here that for people understand. Why this is really important, so those results that are they're part of the different types of knowledge information by the knowledge graph that are being shown across Google search results. There’s a statistic that's really important with this how accurate to the exact number it is. I'll leave that up to others but the term is that 60% of queries on Google are answered without a click or without them leaving Google to do it. So if the click might be into my business listing to call or something like that. What that and what that means is that they're no longer going to the website links to go on see things because they're getting the information and that's the big difference between searching for your business and yes, your website shows up but for and this that could be an American figure, it might be a bit of an average, it might be a bit overinflated but what it's saying is that a lot of the results that Google are delivering don't require you to go anywhere else to get them. So for example if they're looking for your business and all they want is the phone number that's being displayed there. They don't need to go to your website to get it. So that's why I wanted to bring that up. Darryl: How does someone get their business to show? How do they get their business on Google? Darryl: Cool; it's a one thing that comes up particularly for smaller trades people; things like that. Edmund: yeah; absolutely; looks so for example if you had a retail store or you know or a multi-unit retail operation. It's important that you actually list the physical address because that that that feeds into the navigation system and the maps and all that sort of stuff but you're right; there are a lot of us who may work from home and have home offices and don't want that. In that situation you can set what's called a service area and you can actually say; you know what I don't want to list my physical address and I don't want you to show the address in the maps but I want you to allow my listing to be found in a specific service area and so you can say you know 50 kilometers from this location is where I want to get found and that's how you avoid that issue. Darryl: Do you know if that's accurate like the lower in the map listing it's because of that? Edmund: yeah, I would think it's a combination of two things one the nature of the industry and the ….? Edmund: yeah, the challenge as I said with that is that there are a ton of other people probably using the same register business address in that situation and so location wise; it's not going to work and so it basically tells you that you should use the service area and here's the thing. If you're using your accountants address as the address for you’re my business listing well then you're not; that's not the purpose for which Google my business was created. It was created for location specific businesses for which location is important right? Edmund: I know; I know and the frustration is that it's not perfect right and it has gone through a lot of challenges and different levels of support from Google and it is becoming more important and then it becomes less important you know. So it is a challenge right? It’s aggressively spammed in the early days and Google tries to improve it but yeah it's the system that we've got. It generates traffic for a lot of businesses and so we need to work within the constraints of it. Darryl: there's also Q&A? Now that they offer ….? Darryl: so you can actually write Q And A in advance as if you were writing the FAQ on a website. So it doesn't just have to be questions from people asking, so you can actually go in there and go you know these are common questions. Do you sell us? Know we don't. Edmund: yep and the great thing about the listing is; there helps encourage people to do business with you because one thing we know people can leave business reviews, Google reviews about your business and they will be listed there right? In addition to the Google business reviews they actually pull reviews from other places on the web right? So you’re my business listing will actually say; you've got a four point five out of five from Facebook for example. and the other feature that I love is if you're a very time specific business it even shows you popular times of when your business is busy right and they base that on the data that they have but as a business owner there's a whole bunch of information that you can get access to about it. Which is really powerful like one thing that the insights aspect of it is they tell you where the people found you in organic search or they found you on the maps right? It also tells you what action they took, did they click on the call button, and did they navigate right? And the other interesting aspect too is it also is starting to tell you the places from which customers actually have actually requested directions to your business. So it pulls up a little map and says you're located here but customers over in this suburb. That’s where they're actually requesting map navigation information and so you can start to use all this information to figure out; oh, my customers are in this area this is; these are the times that they're looking for me and then you can post up those promotional things as well. So it's a really important tool for every location specific or service area specific business who wants that visibility in Google search, who wants to be found when people are looking for them and if you're not in it you're missing all these little opportunities to engage. Edmund: yep, set it up encourage people to leave reviews stay on top of it because it's onl;y will we see that this is going to be the pointy end of the voice search at some point in time that's how; we're a lot of information is going to as people move to voice. Alrighty? What do you reckon Darryl have recovered everything?